the pink clutch ...: Happy Halloween!! For years I have steered clear of anything too much for Halloween. 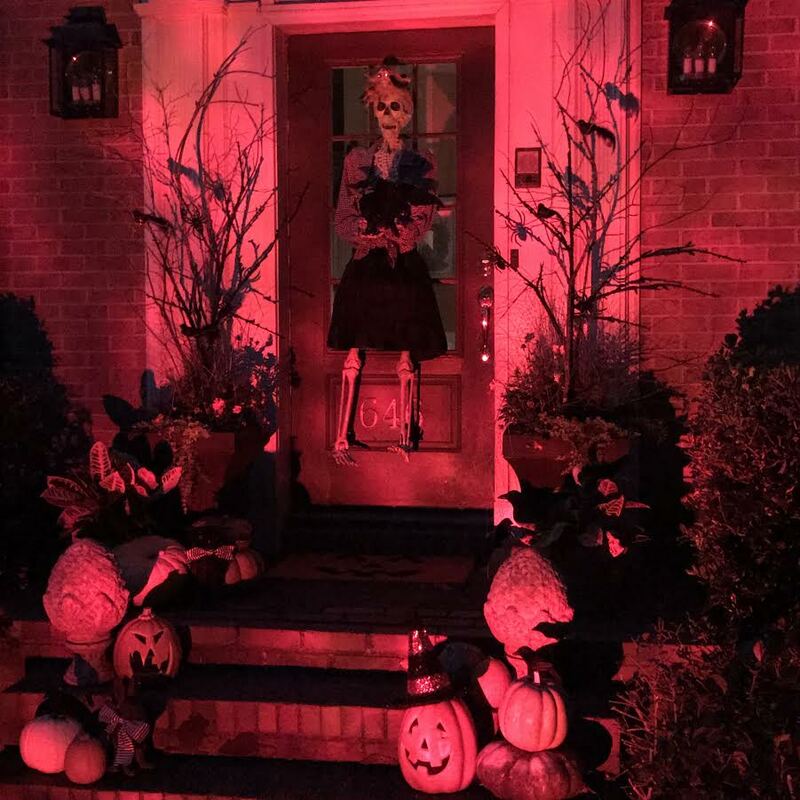 Maybe it is my upbringing or maybe it was me trying not to scare the pants off my own kids, but I was a fun wreath and tons of pumpkins kind of girl when it came to Halloween decorating. 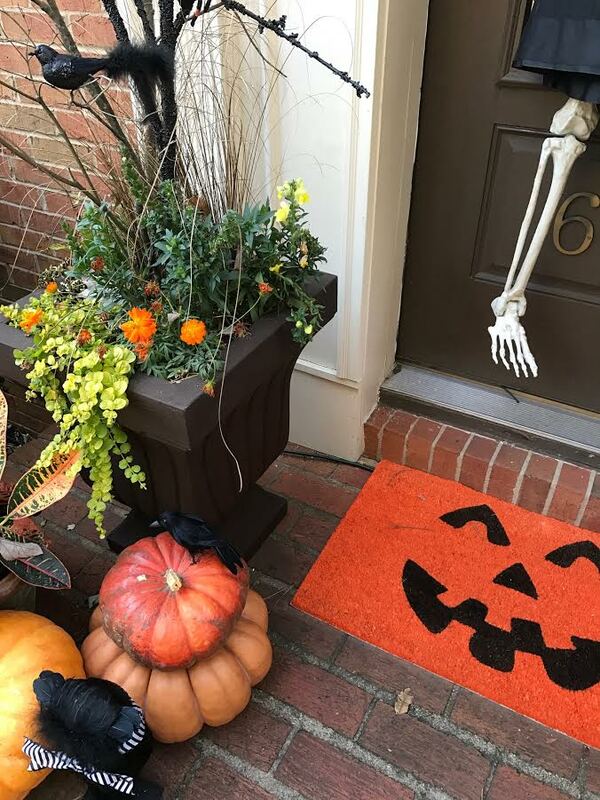 Last year as we Trick or Treated something my youngest said really stuck with me ... "why are we the house that only puts out a wreath for this evening?" Honestly I couldn't give her a good answer and this year I vowed to take the decorating up a notch, or three! 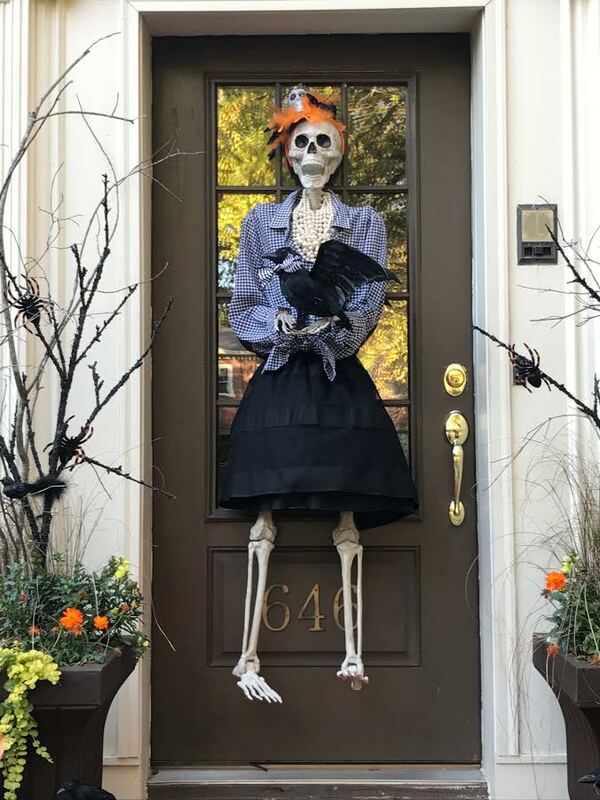 When I was shopping for fall planters for this post from At Home I spotted this darling skeleton and immediately my creativity kicked in. 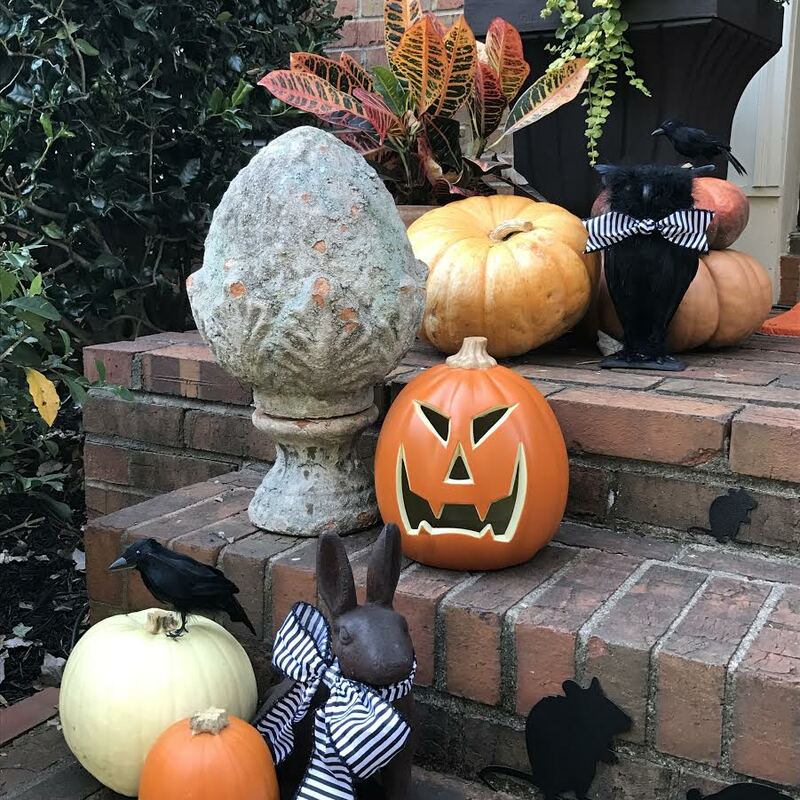 I immediately thought of a million ideas and before I left I had filled one cart for fall and one cart for Halloween to create something that would make the kids proud as they tooled past the house to Trick or Treat. After listening to them as I worked on the porch this weekend I think I achieved exactly what I was hoping to create. We have the scary but yet fun house all prepped for this evening!! 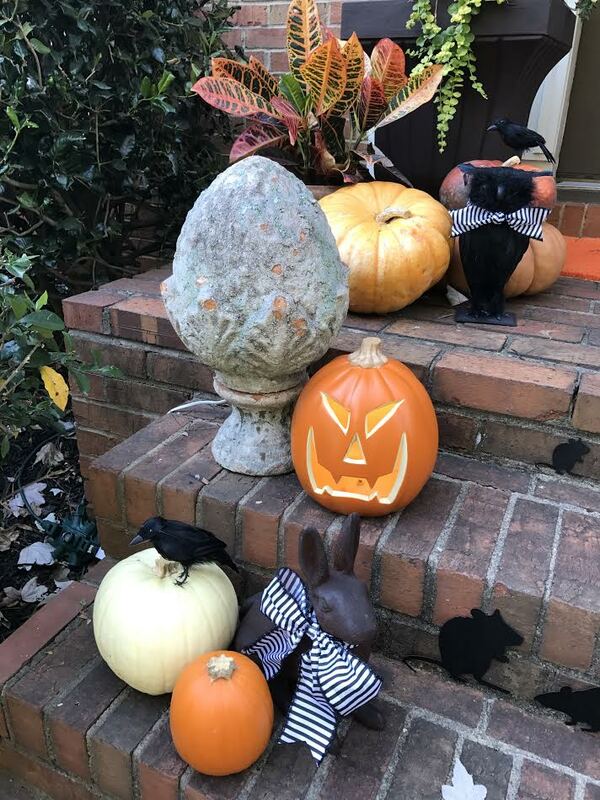 Since I already had styled the porch for fall I didn't want to remove the planters and completely start over, I just wanted to make them a little creepy for the evening. I love how everything has grown and filled out in just a month's time. 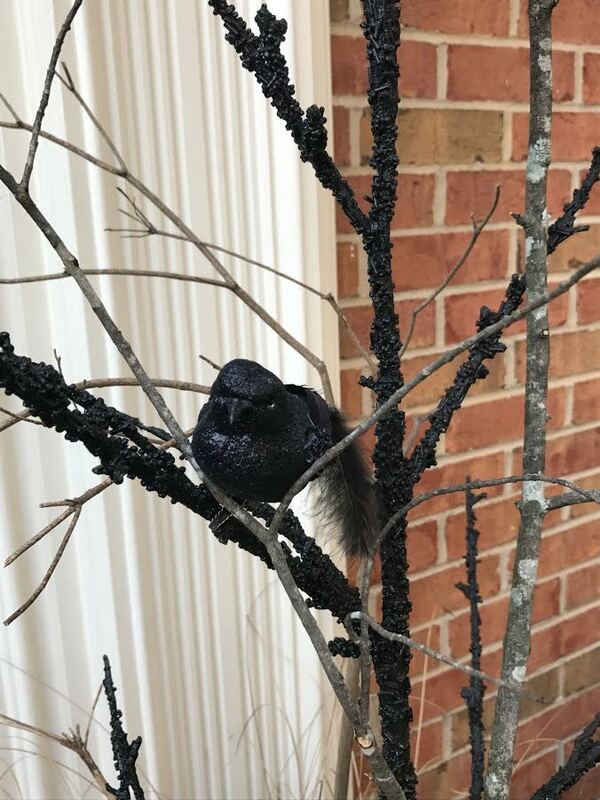 I added some dead branches from the yard and black birds and spiders from my shopping trip. I found these black branches in my stash in the work room from years ago and added them in to make it a little more bulky. 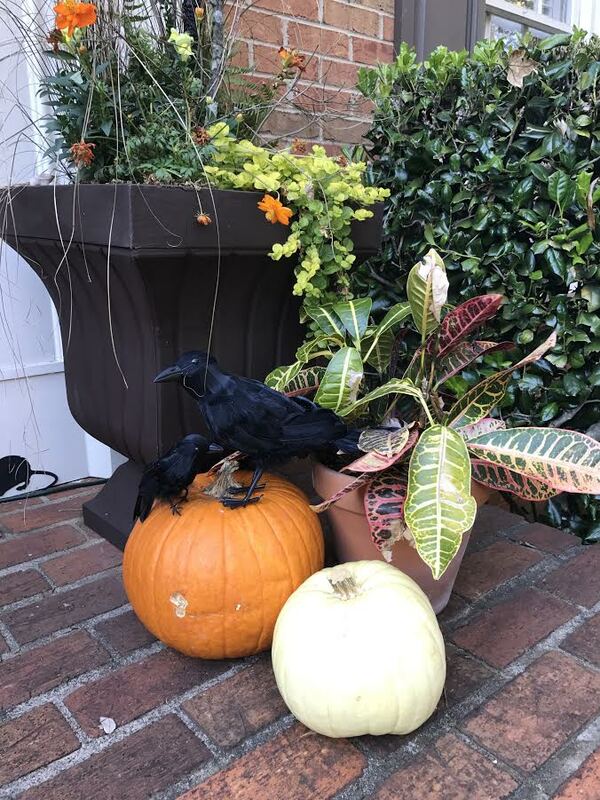 I love the result, and when I am ready to remove the branches I still have my amazing fall planters and a few pumpkins as long as the weather doesn't warm up once again. 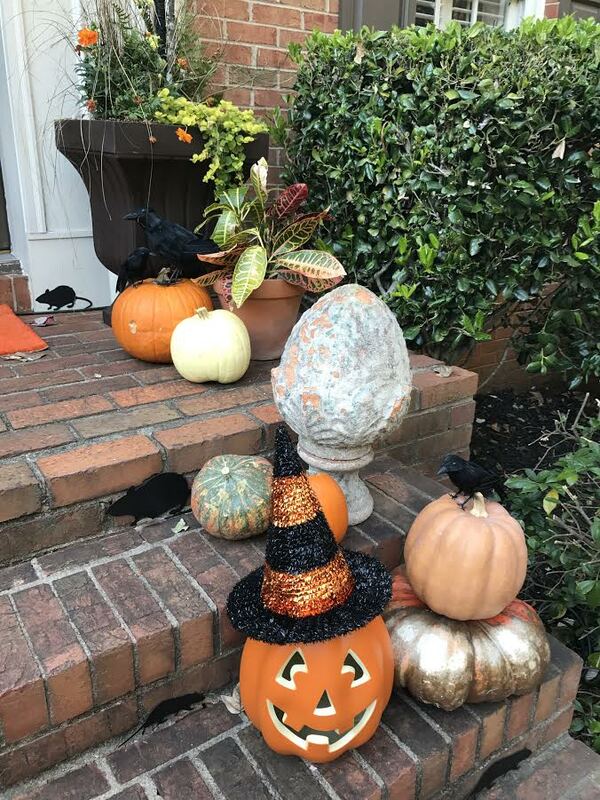 The Jack-o-Lantern door mat along with all of the animals (birds, owl and large crows) are a few of the things that filled the cart that day. 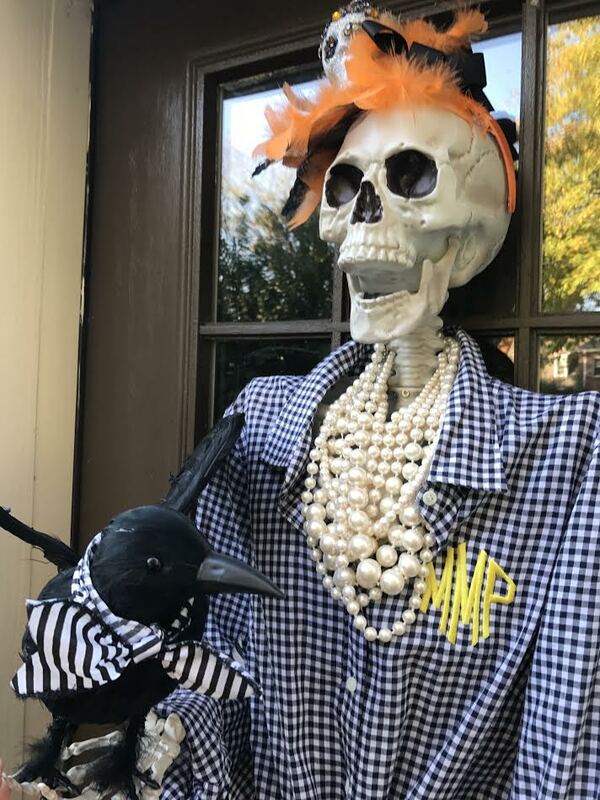 I am sure the customers thought I was a bit mad when I was stuffing my cart in late August with Halloween decorations, but when you are inspired you have to run with it! 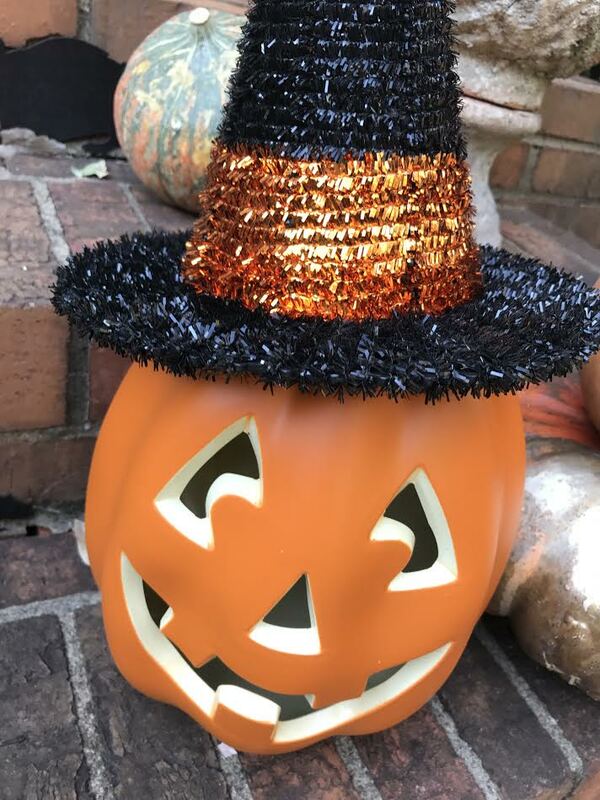 A Jack-o-Lantern with a fabulous hat? #yesplease!! 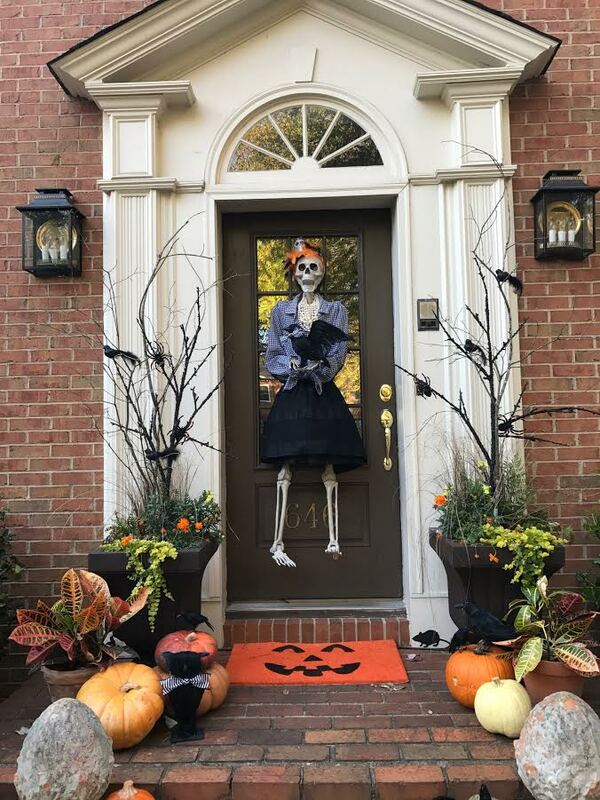 I can't take credit for this idea ... it was in one of the many amazing displays at the store and I feel in love with it! 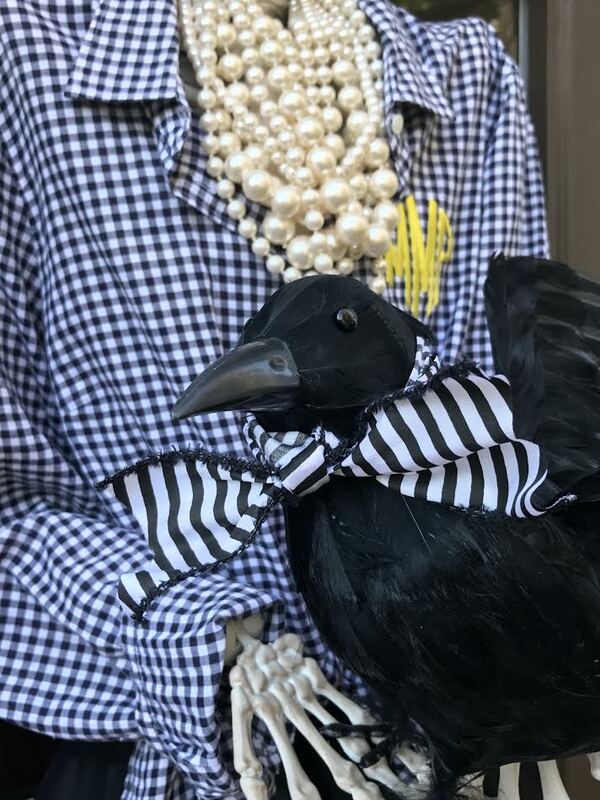 I have to say dressing Menacing Millicent (my friend Natalie named her) was my absolute favorite part. I knew immediately she would be wearing a gingham shirt, a tutu and pearls but she is even more amazing than I planned. 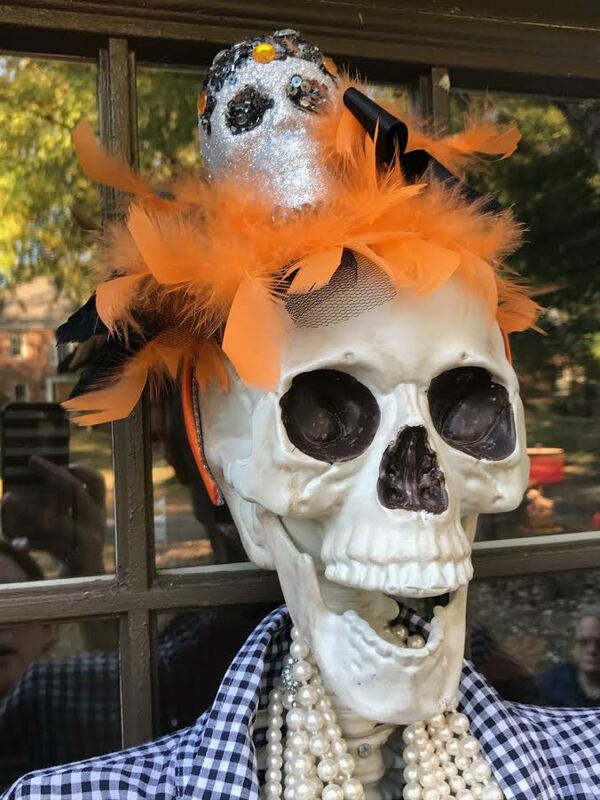 Her darling scary head band is also from At Home and it lights up at night. So much fun ... I can hardly stand it! I have to make sure I remember she is hanging on the door, every time I walk by I think we have a visitor and I get all excited. Oh, silly me!! Of course I had to dress the animals, I mean that is just the way I roll! 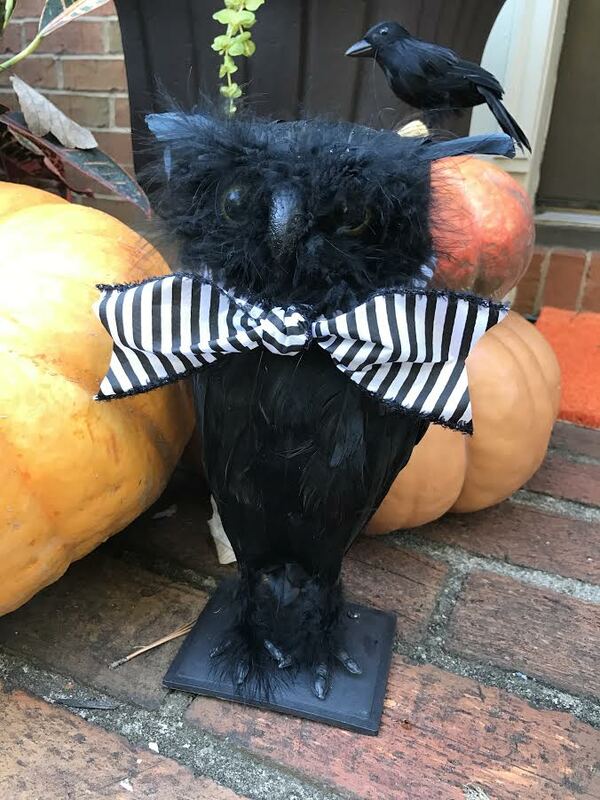 Hoot the Owl got a bow tie and the bunny statue got a bow and the crow in Millicent's hand also was treated to a bow tie. I mean, why wouldn't they be? The kids helped me with the placement of the rats and the Hubs ran out to find me a creepy light to take it to the next level. Isn't it fabulous?? You can't see it in this photo, but it is a strobe light and I will admit it is a smidge scarier than I planned. One of my littles said I am not sure the small kids in the hood will even come to see you if you leave that thing on. Ha ... we shall see!! Paige, I love this! 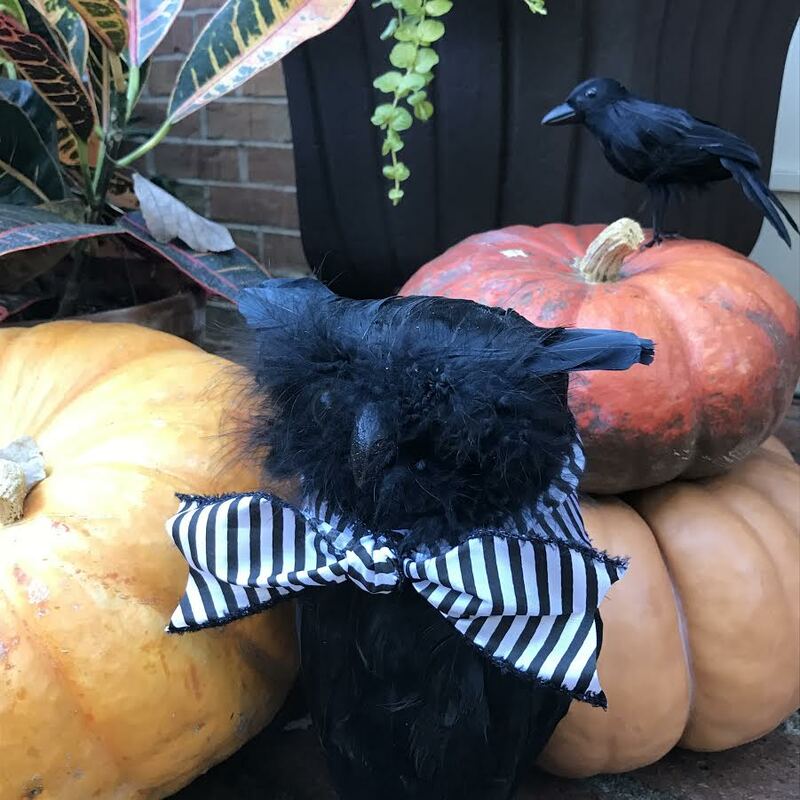 I hope you have a happy halloween and check out my Spooktacular Halloween at Uptown Acorn. Paige! That is amazing. 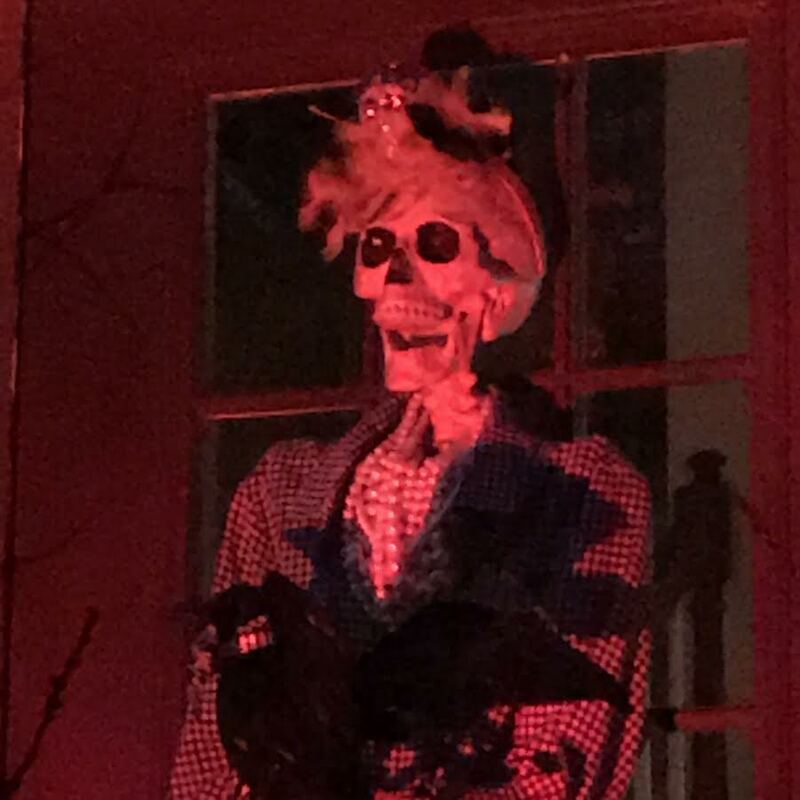 So festive, yet not super creepy. Millicent is the bomb!! Paige, for a first time scary gig, I'd say you hit a home run! Love your clever take on scary. The pearls do it for me! Happy Halloween! LOVE it! 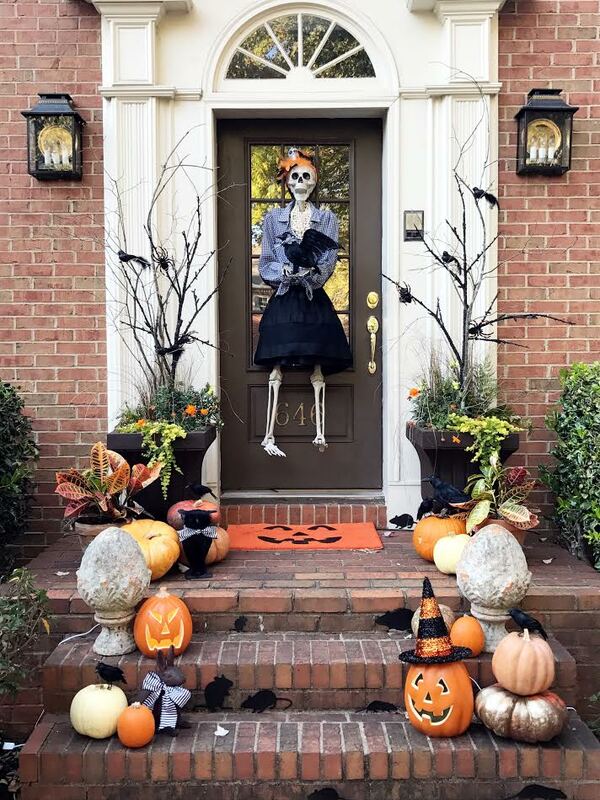 This is one of the best front porches I have seen this year! And the pearls are the perfect touch! Awesome! Love this! 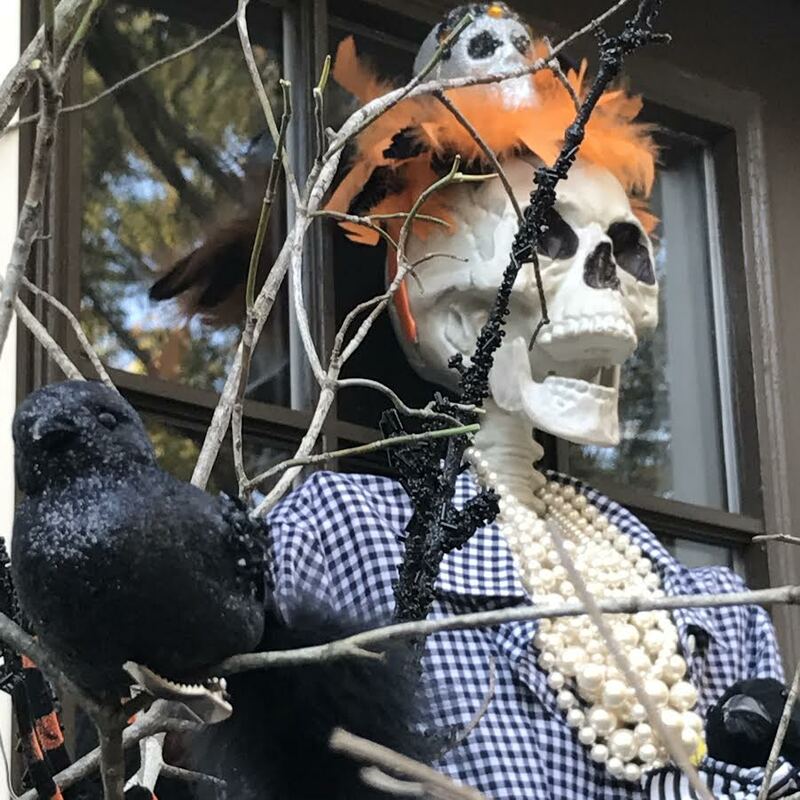 Millicent is amazing and the birds such a spooky touch. Happy Halloween!